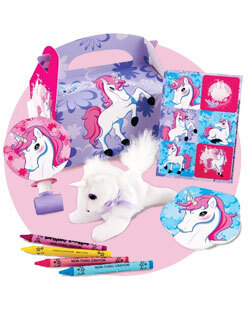 Help give your daughter a birthday party she's going to love, and all her guests will remember when you get Unicorn Fantasy Party Supplies! There are tableware items like napkins, table covers, plates, and cups, as well as favors like goblets, key chains, stickers, and more! You can also get decorative items like balloons, banners, and personalized invitations! Many children may dream of having a pony as a pet, but those with wild imaginations dream a little bigger and hope for a pet unicorn to carry them away to a magical dreamland. Turn your child’s fantasy into reality with a unicorn-themed birthday bash to celebrate his or her colorful imagination, pure heart and magical smile. All the children will be enchanted by the sparkling decorations, captivating games and delicious treats. With all the majesty and grace of a beautiful unicorn, you will pull off a birthday celebration everyone can enjoy. If you need a magic elixir to conjure up the perfect party, you'll find it in the pre-planning stage. Once the RSVPs come back, all of the puzzle pieces will have come together. This means you'll be able to enjoy your children’s party right along with them. Based on the number of guests, you can create a menu and plan games, prizes and activities, including a buffer activity like a dance party or movie in case something falls through. It is always important to have one last trick up your sleeve, after all, in case you need to fly in and save the party. The great thing about a unicorn party is that anything is possible! To gather inspiration from other party themes, visit the Birthday Express Ideas Blog. While the theme may differ, you can apply some of the same creative ideas to fit your enchanting theme. It’s your own magic wand for planning the perfect party. 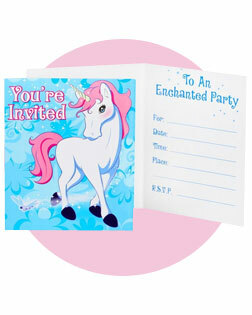 Give your guests the opportunity to be whisked away to a magical world by their very own unicorn messenger. No need to get messy with glitter all over your kitchen table, as these invitations come with all the glitz and glamor you crave and none of the mess or timely trail and error. Just grab your guest list and start licking stamps, because these invitations are ready to fly to your guests' front door. No matter how many activities you have planned for the day, the magic will fizzle out if you don’t set the scene right. Light up the room with shimmering banners, glittering centerpieces and magical wall art that will make your home feel like an enchanted palace. All the princes and princesses at the party will be blown away by the intricate details that are easy to set up and easy to take down. Getting the party started will feel like your fairy godmother swept through and transformed the place with the wave of her wand – or the click of your mouse. Take your party to new heights with colorful balloon bouquets. You don’t need to grow a pair of wings to enjoy this mix of foil and latex balloons. This bouquet will magically dance in the breeze atop any surface, high or low. Use the bouquet as a landmark to show where gifts are, where the cake will be served or even where to find the bathroom or game zone. Make the guest of honor squeal with delight when he sees his name gracing a personalized banner. Hang it high above the entrance or prominently in the celebration area to mark the special occasion. The guest of honor will certainly appreciate the extra magic it took to make this day a dream come true. Set the perfect backdrop to send your taste buds on an unforgettable adventure. From scrumptious snacks to tasty cakes, your little ones will be eager to sit down at their place settings. While they wait for the food to arrive, they will be able to marvel at the majestic plates, cups and napkins that pull the whole theme together. It’s not magic that the kids are worn out at the end of the day. Instead, it's due to a lot of hard work and planning by those in charge of the activities. 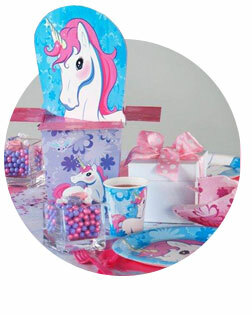 While the general excitement of the festivities and the sugar rush may make the kids hard to wrangle, you will be able to successfully hold their attention with these enchanting games and crafts that are perfect for a unicorn-themed celebration. What is more magical than candy falling from the sky? Treat your guests to some take-home treats as they fill their goodie bag with individually wrapped candies and small toys. Let each guest take their swing as they attempt to unlock the treasures hidden inside the piñata. Keep the laughter flowing as your guests attempt to pin the horn on the unicorn. This classic party game has a fresh twist that falls right in with the theme of your day. Don’t forget to offer the extra challenge of spinning each partygoer around in a few circles before releasing him or her for the pinning. Thank your guests for making your day so magical with a treat that they can remember the day by. Allow your guests to rummage through a box of treasures and see what their imaginations can craft out of each magical item in the favor box. 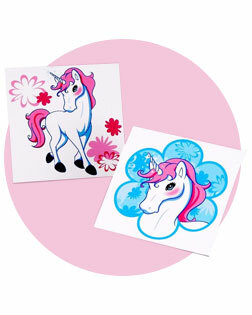 Wear your heart on your sleeve and your stars on your cheek with these sparkling temporary tattoos. Send your guests a token of your appreciation along with one final reminder of the magical day. They will welcome the enchanting images that remind them of all the fun they had.